As a dog trainer, I’m always reminding my clients about the importance of exercising their dogs. 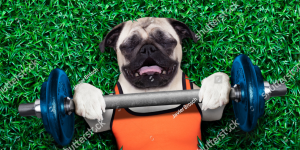 But physical exercise alone isn’t always quite enough, especially with breeds such as the Border Collie or Australian Shepherd, or Jack Russell Terrier. Retrievers and Terrier breeds come with with their own batteries that are on the charger all day long! Most of our dogs were bred to work. We have herding dogs, hunting dogs, protection dogs, flock guardian dogs, sled dogs, etc. It’s alarming when people tell me they don’t have to take their dogs out for walks because they have a backyard to run and play. Relying on the backyard to provide exercise stops all socialization since there is zero interaction with the world at large. That means the dog never gets to see or play with other dogs, s/he never gets to greet the neighbors or see children of all ages, s/he never gets used to hearing traffic or seeing moms walking their babies in strollers. Isolating dogs causes boredom, fearfulness and sometimes aggression. Sports Activities (Agility, Flyball, Canine Musical Freestyle, Tracking, Dock Diving, Lure Coursing, Sheep or Duck Herding, Hiking). Group Training Classes (AKC Canine Good Citizen, Pet Therapy, Tricks, Rally-Obedience, Nosework). Best Toy for Super High-Energy and Herding Dogs (Flirt Pole) See video below. Make your dog’s meal a hunting expedition. Take his bowl of food out on your lawn (grass should be cut short. Ask your dog to sit and stay. Take out a few kibbles from the bowl and toss them on the lawn. Tell him to “Go Find It!” Make it easy for him to find them at first. Call him back to you and place her back in a sit/stay. This time take a slightly larger amount of kibble out of the bowl and toss them over a larger area, but it should still be easy for him to find his food. Once he knows the name of this game, It shouldn’t take too long before your dog learns how to hunt for his food. I promise she’ll love it! This is just a small sampling of how to provide very fun and stimulating activities for your dog. I hope you like them! This entry was posted in Living with Your Dog on June 30, 2018 by renee. Does your dog turn into Cujo as soon as he sees (1) another dog; (2) a white man or a black man; (3) a woman walking with a stroller; someone riding a bike; or a jogger? Unfortunately, this is not a unique issue. 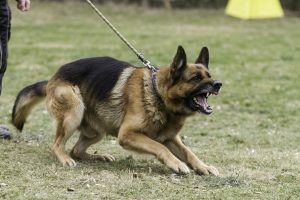 We’ve discussed the importance of early socialization recently to prevent such behaviors, but what should a pet parent do when their dog is behaving this way? Should we yell at the dog? Should we do a leash correction or use a shock collar so the dog knows he’s being bad? Or, should we just tell the dog to “SIT!” until the stimulus that’s causing the reactivity goes away? NOOOooooo! Keep in mind that reactivity is based in FEAR. When a dog is scared, he can make one of two choices: FIGHT or FLIGHT. That decision is based on the dog’s temperament. Without getting boringly technical, let’s just say the dog is having an adrenaline rush. If the dog looks like the one in the photo above, he probably can’t even hear you when you’re speaking to her. There are very good behavior modification protocols available to us to help make the dog feel better when faced with scary stimuli. But I want all of you to know that your default behavior should be to CREATE DISTANCE! Purchase a well-fitted Freedom harness or a Gentle Leader head halter. Each of these can help you gain good control of your dog so you can make an “Emergency U-Turn” in order to get the heck outta Dodge. Check these items out at Amazon. Never ask your dog to sit when faced with fear. Help your dog and let him know you are the one who can protect him! Your dog needs to have that confidence in your ability to keep her safe and out of harm’s way. This entry was posted in Uncategorized on June 17, 2018 by renee. So… you want a new puppy. You look for breeders, you research online and you see pictures of the most adorable puppies being offered, you see a picture of a pup and you’re all excited to go see it. The breeder brings out your puppy of choice, along with a litter-mate. These pups are the last to be sold. 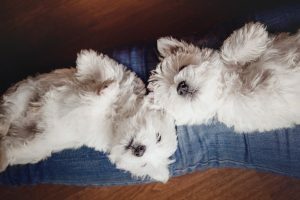 Breeder tells you how attached the two puppies are, and it would be really sad to separate them. Your heart melts and you return home with two dogs. You place both pups into one crate. When feeding the puppies, you put their food into a single bowl for both of them to eat. You allow them to be together all day and love to see the strong attachment they have toward each other. Around the age of 4 1/2 to 5 months, you begin to notice the puppies are squabbling with each other. One puppy is always trying to steal the other one’s chew toys. That same puppy gets very upset when his sibling is getting attention from the humans in the house. When eating their meals, that same puppy will not allow his sibling to approach the bowl until he’s finished eating. One day your two loving dogs are having more serious fights, even when they’re in the crate! Suddenly you realize you need help from a professional. This entry was posted in Behavior Information on June 12, 2018 by vlm.